Startup Marketing Dilemma of Maya a homemaker who wants to be financially independent in her ready to eat food business. 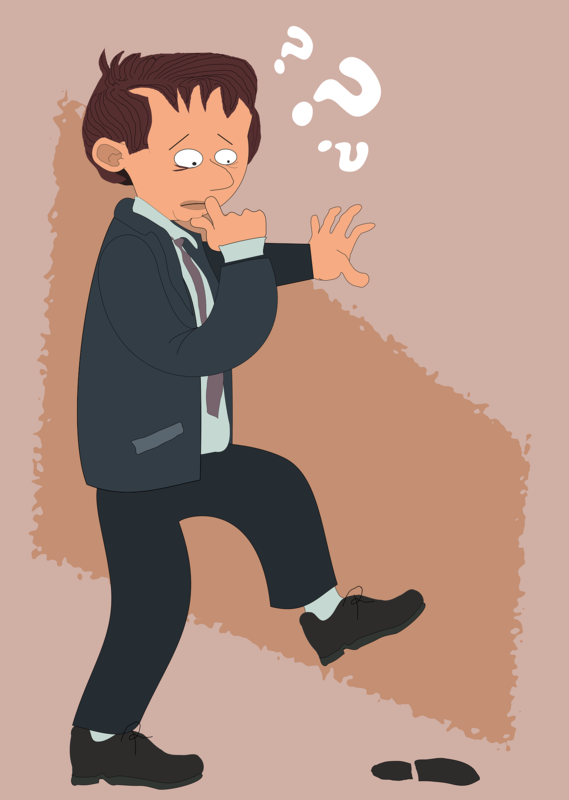 Marketing is necessary evil! And, it should be handled simultaneously. 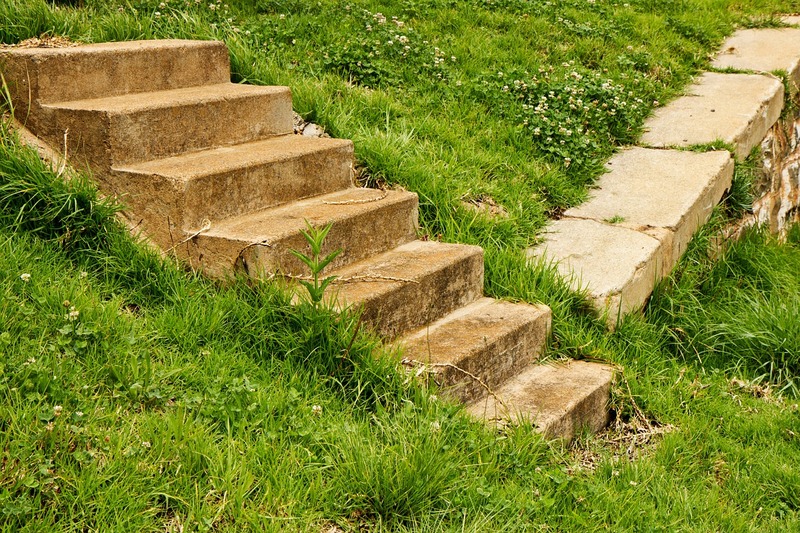 The argument here is – what if startups focus more on improving the product, making it more user-friendly, intuitive, and engaging - allowing it to grow naturally with minimal effort on marketing and sales activities. I believe that ‘Word of Mouth’ publicity is more valuable in the early iterations; it attracts new customers to the platform and retains them for a longer period. In this highly competitive and quick evolving landscape; Customer engagement and retention is the key to success. Maya is a home maker. -An excellent cook. She loves to experiment with recipes, adding a pinch that-a dash of this and so on. When she decided to become financially independent her thoughts naturally turned to what she is good at- cooking. She launched a ready-to eat-food business with the help of a relative. :Maya is in a bustling metro town. People have little time on week days to prepare meals and are opting for healthy ready to eat foods. Maya had less than 500$ as cash resources. Her tight budget did not allow her to engage a full time marketing person. She could devote only 4 hours/ day on her business and of that she spent 2 hours on marketing. She tried various approaches but yet find the right fishing hole which would give her more customers per hour of her limited time. 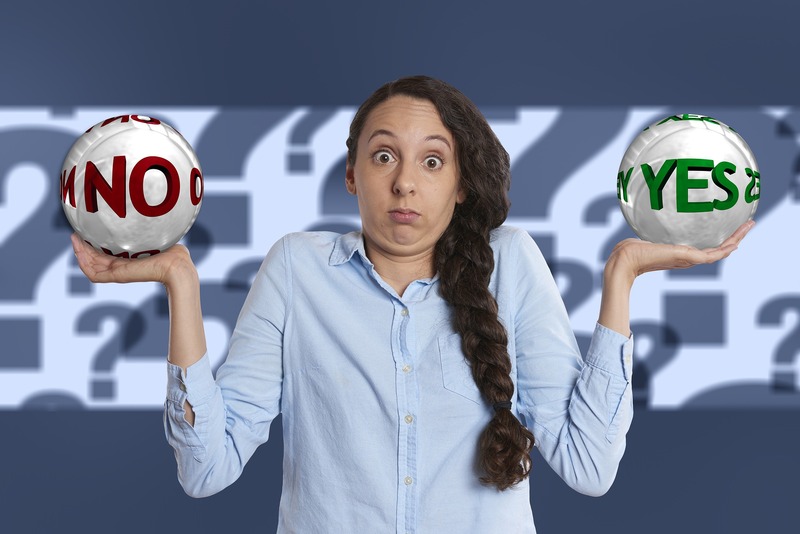 She listed three lead generation approaches which will help her to meet her potential clients with limited time available. 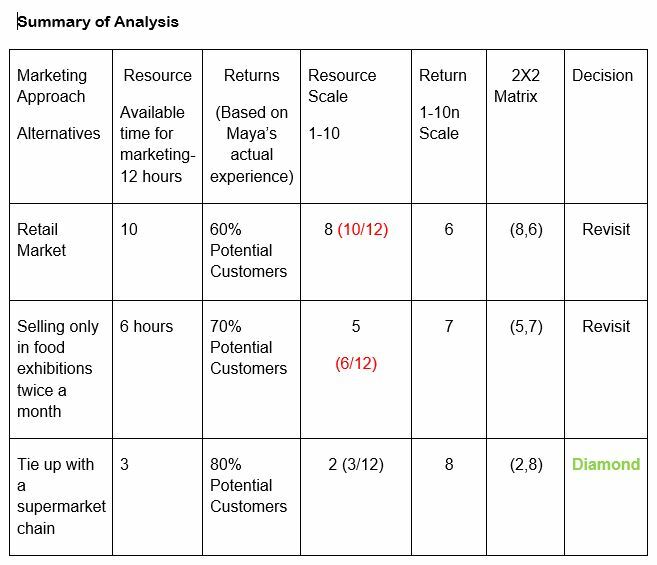 She estimated the resources and return for each marketing alternative so that she can plot the Resources- Return matrix to discover her diamond. Since her time is critical she evaluated all the alternatives to select one which will get her more customers per hour of work. The Cash resources cannot be stretched. Booking Orders, visit to retailers and payments follow up. 60% success rate for the time invested. Resource: Two full days of 8 hours each -16 hours /month on marketing alone. Further pre arrangements will require another 12 hours / month. Maya is required to visit supermarket once a week. She has to spend 3 hours per week. Return: She has achieved 80% success rate. The cash requirements for all alternatives are below the budget of $ 500. Discover Diamond by plotting in the resources score (X axis) and Return score (Y Axis) and discover the diamond. 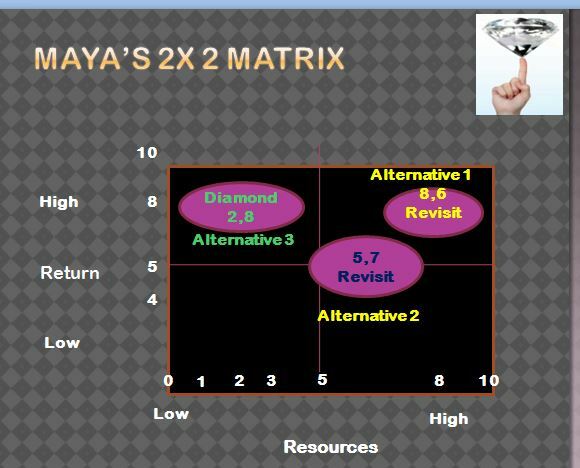 Alternative 3 is the diamond as Maya invests less time but gets higher return by way of right fishing hole. Her aunt offered to look after manufacturing. Now Maya is planning to expand capacity, hire a sales person and also an assistant to help her in selling at exhibitions.